Part of the appeal of Escape Literature lies in the fact that students can read Science Fiction novels that allows them to escape the monotony of every-day life. Another part of the appeal, though, is the teacher herself: Erin Angell. 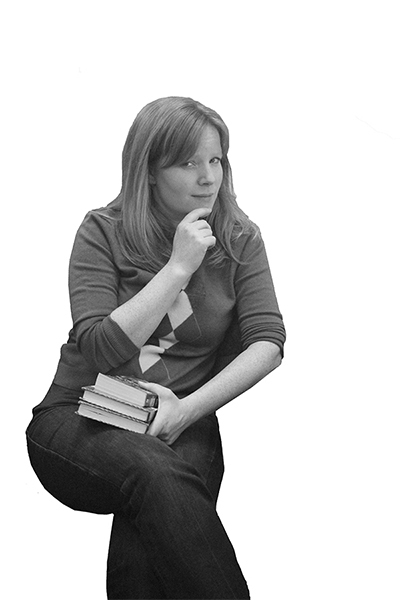 With fiery red hair and a matching personality, Angell is just as great a source of excitement as the books she assigns. Describe yourself in three words. Erin Angell: Tenacious, energetic, loyal. Tell us about your cows. EA: My cows! Ok, so I have two cows. They currently live at my dad’s because my dad has some property and a barn and things like that. My cows’ names are Freckles and Biscuit, and they’re about 6-months-old. They’re adorable. We put santa hats on them for the holidays, and they’re just delightful animals. I love them. They’re so sweet, and I can’t say enough about them. What was the last TV show yo u watched? EA: “True Detective” [shouts]. Love “True Detective”. You get in that moment of, “Do I DVR it and wait and stockpile?” Because that’s how much I love it. … You get to the end of one of them and you’re like, “NOOO,” and you have to watch the next one. But then you have to exert self discipline where you don’t watch it [and] you have to wait for it to accrue. What is your biggest pet peeve? EA: No water left in the percolator! What is your favorite book? EA: I would say right now my favorite book is “Blood Meridian” by Cormac McCarthy. It blows your mind. You stop reading it, and you think, “Well, that happened.” It’s surreal. I stopped reading it because I finished it, and I just kept going back to it. I laid in bed, and I literally could not go to sleep. … It was just one of those things where you try to go to sleep but your eyes just keep opening, but it wasn’t because I wasn’t tired, it was because of this book! I had this feeling … that I’ve never had before, it was just this pervasive presence. EA: My style … like clothes? Casual. You can never be certain when the zombie apocalypse will strike. Wear sneakers. How has being a redhead benefited you in life? EA: If you’re ginger they’re expecting that you’re going to bring the sass, right? So because they expect that of you it gives you permission to be that way. They might not expect that of other people … but with redheads they can just roll with it and so I feel like that gives me some sass. People also are very fascinated with red hair when I travel, particularly if I travel some place where there aren’t a lot of redheads. They’re very interested and curious, and I get people complimenting me and they’re friendly and they want to know, “How did you do that?” and, “Is that your real hair?” and I’m like, “yes,” and they’re like, “Ah, you’re so lucky” and it’s just, how do you get tired of someone saying you’re lucky? What would you tell your high school self if you had the chance? EA: I would tell myself that my hard work was going to pay off, and worrying never extended anybody’s life another minute. Post-High School Crisis: I’m Scared of the Future. Is That Okay?